Available in 500g, 1kg, 2kg and 5kg bags. 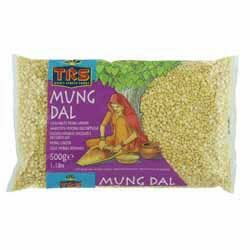 Mung dal, also known as 'Dhuli Moong' or 'Payatham Paruppu', are yellow lentils that have been hulled and split. They are particularly easy to digest and take on seasonings and spices well, so are often made into spicy dhals. "Dear Spices of India, I received my first order from you recently - well packed & sent promptly. I was delighted with the ingredients. I tried some of your recipies (I am no great cook) but the results were as good as - or better - than a takeaway! I'll certainly be back for more."